This photograph was taken for the Archaeological Survey of Western India in the 1870s. The building cannot be traced from the caption given in the album. 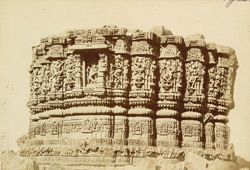 Bloch's list describes it as "the Temple of Mahadeva, Sonepur: view from north-east". Instead it is probably the Rudra Mala Temple at Desar near Sonipur, in Gujarat, viewed from the south-east. The Rudra Mala is a small stone Siva temple with richly carved walls, perhaps dating to the 14th century.